Robert James Corry was born on 20 September 1876 at 36 Cumbermere Street, Belfast, the second of six children of car driver William Corry and his wife Ellen (nee Burns). He followed his father's trade as a driver before joining the Belfast tram service, soon becoming a tram driver. On 7 July 1897 he married Annie McCune at Crescent Presbyterian Church, Belfast. The couple had ten children over the next eighteen years. The 1911 Census shows them living at 31 Houston Street, Robert working as a tramway motorman. Corry enlisted in the North Irish Horse on 1 October 1914 (No.1230 – later Corps of Hussars No.71292). In the first half of 1915 he embarked for England with F Squadron, where they awaited orders for France. On 12 July, however, Corry was one of about two dozen men of the squadron who volunteered for service as Military Mounted Police with the 54th (East Anglian) Division, which was under orders to join the Mediterranean Expeditionary Force. They sailed from Devonport on HMT Manitou on 29 July 1915, joining the landing at Suvla Bay between 10 and 16 August. Lance-Corporal R. Corry, formerly a Belfast motorman, who entered the tramway service a very young trace boy, and has been in it ever since, without a 'bad mark' against him; and T. Wilton, another Belfastman, two close chums, belonging to the North Irish Horse. They spent four months with that regiment at Suvla Bay, and took part in the famous charge, when the heights were carried. They left Suvla Bay with the Australians, and are now in Egypt. The photograph shows the Sphinx itself, and the Great Pyramid. 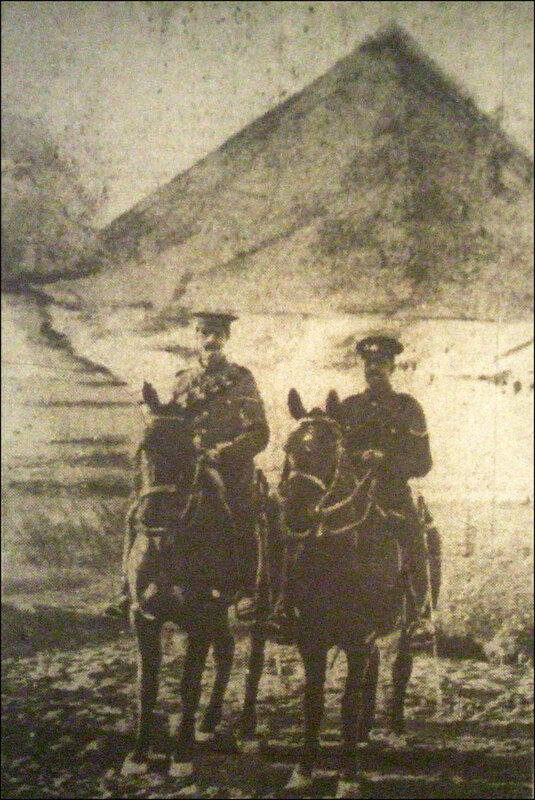 The two men, both lance-corporals, are doing military mounted police duty in Egypt. The figure to the left is Corry, and the figure to the right is Wilton. Corry continued serving with the Military Mounted Police. He formally transferred to that regiment in June 1918 (No. P/14891) – with effect from 30 August 1917. From May to August 1918 it appears he spent time in the UK, perhaps recovering from an illness, before returning to Egypt. He was transferred to Class Z, Army Reserve, on 18 April 1919. Image, from the Belfast Evening Telegraph, 2 March 1916, kindly provided by Nigel Henderson, Researcher at History Hub Ulster (www.greatwarbelfastclippings.com).